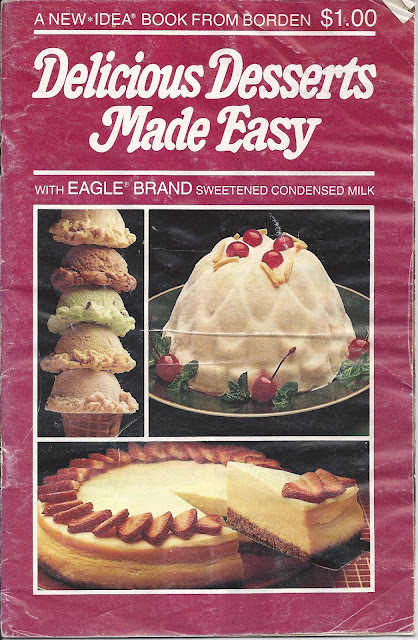 Eagle Brand sweetened condensed milk has been on the market for more than 125 years. I have used it all of my cooking life. I think it is just as popular now as it was when it was first introduced. While it has various uses, I think that desserts are the most common. This cookbook Delicious Desserts Made Easy published in 1981 by Borden Company has many of the most popular recipes in it. I bought it new and as you can see, it is really well used. We have featured recipes from it and I guess I would have to say that the ice cream recipes are the ones that both Sue and I liked the best. There are some good pie recipes, their lemon pie and pumpkin pie are both excellent. There is also a good recipe for fruitcake. If you run across one at a book sale or garage sale, this is a fun cookbook to own.